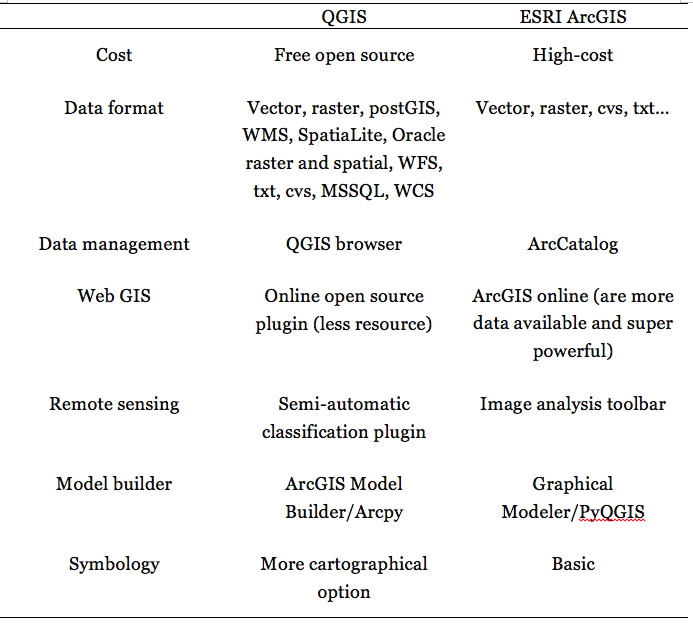 Recently, I’ve been asked which GIS software is the best between QGIS and ArcGIS. It’s quite obvious already that these two are the most popular, and better geospatial analysis tools out there and people who do spatial analysis have noticed. Both of them have huge user groups, and you could get lots of help online. Even though you might want to check out these other tools, including SAGA GIS, GRASS, some R geospatial analysis packages. Let’s go back to ArcGIS and QGIS, GISGeography, have pull the reviews of these two software together that ArcGIS has been received 9.2 out of 10 score, and QGIS is 8.9. Each of them have the constrains, but also have something that stands out definitely. At this point, I would say it really just depends on your preference, your needs and questions. I’ve used ArcGIS for very long time, and have just tried out QGIS recently. The summary of differences between these two are based on my personal experience, this cool blog and other resources. Simply, if you are more analytical personality and are more into geo-informatics , ArcGIS will be a great investment. If you wanna just produce good looking map, QGIS is free and could be a good choice. If you do more 3D demonstration go for ESRI products. If you are in the united states and wanna get a job here, ArcGIS will be right direction to go since all the state department and even private companies require ArcGIS skills and knowledge. ArcGIS has more hand-on example, QGIS has a good tutorial as well, but since ArcGIS has bigger and better educational team, you would get more help and tutorial online for ArcGIS. However, if you are outside of the united states, and English is not your first language, I would recommend QGIS, since QGIS have more different language build-in. If you are going to use some simple geospatial function to fulfill your research/academic and simple mapping skill rather than more profound geospatial analysis, i would also say QGIS. If you are already doing a lot of MATLAB and R coding I would say, QGIS might be a better choice outside of the states even though ArcGIS have its technical support teams in other countries besides in the states. Last tip that QGIS could run on Mac and windows, but ArcGIS only could run on windows so far if you are not using python scripting for ArcGIS. I’d also say that the image (blog you link too) misses things in ArcGis-can take raster formats that Qgis can’t and many formats the blog does not mention, or extra Arc Toolboxes, and many of the things in the blog can be done in both (with various levels of ease). One thing it also fails to really mention is that ARC is big and heavy to install and run, considerably more so than Q….. Thanks for sharing these points about QGIS, Alice. It would be very helpful for people out there wondering. I used QGIS for vector layers editing and overlapping these very simple things, and was using 2.1. I funded it quite appealing. QGIS makes much prettier map. I also find there are more open source image processing softwares are developed as QGIS plugins, I wish they could run better in the future. In my opinion, open source softwares would have more option for users since people who contribute are doing quite broad things, but would be more bugs in particular functions because fewer people really devote their time and knowledge on fixing the problems. Even QGIS have much more and nicer features for cartography/map display, but ArcGIS Online is catching up the cartography and the analytical functions are very powerful.